The Tupolev Tu-2 (development names ANT-58 and 103; NATO reporting name Bat) was a twin-engine Soviet high-speed daylight and frontline (SDB and FB) bomber aircraft of World War II vintage. The Tu-2 was tailored to meet a requirement for a high-speed bomber or dive-bomber, with a large internal bombload, and speed similar to that of a single-seat fighter. Designed to challenge the German Junkers Ju 88, the Tu-2 proved comparable, and was produced in torpedo, interceptor and reconnaissance versions. The Tu-2 was one of the outstanding combat aircraft of World War II and it played a key role in the Red Army's final offensives. In 1937, Andrei Tupolev, along with many Soviet designers at the time, was arrested on trumped-up charges of activities against the State. Despite the actions of the Soviet government, he was considered important to the war effort and following his imprisonment, he was placed in charge of a team that was to design military aircraft. Designed as Samolyot (Russian: "aircraft") 103, the Tu-2 was based on earlier ANT-58, ANT-59 and ANT-60 light bomber prototypes. Essentially an upscaled and more powerful ANT-60 powered by AM-37 engines, the first prototype was completed at Factory N156, and made its first test flight on 29 January 1941, piloted by Mikhail Nukhtinov. Mass production began in September 1941, at Omsk Aircraft Factory Number 166, with the first aircraft reaching combat units in March 1942. Modifications were made based on combat experience, and Plant Number 166 built a total of 80 aircraft. The AM-37 engine was abandoned to concentrate efforts on the AM-38F for the Il-2, which required Tupolev to redesign the aircraft for an available engine. Modifications of this bomber took ANT-58 through ANT-69 variants. A further 2527 aircraft were built at Kazan, with these modifications. Production ceased in 1951 after a total of some 3,000 aircraft were delivered to various Soviet Bloc air forces. Built from 1941 to 1948, the Tu-2 was the USSR's second most important twin-engine bomber (the first being the Pe-2). The design brought Andrei Tupolev back into favour after a period of detention. Crews were universally happy with their Tupolevs. Pilots could maneuver the aircraft like a fighter, it could survive heavy damage, and it was fast. The Tu-2 remained in service in the USSR until 1950. Some surplus Tu-2s were provided to the Chinese People's Liberation Army Air Force for use in the Chinese Civil War. Some Chinese Tu-2s were shot down by United Nations airmen during the Korean War. In the 1958–1962 'counter-riot actions' in the 1959 Tibetan uprising in Qinghai-Tibet Plateau covering Qinghai, Tibet, southern Gansu, and western Sichuan, Chinese PLAAF Tu-2s took on the roles of ground-attack, reconnaissance and liaison. The Chinese Tu-2s were retired at the end of the 1970s. After World War II, the Tu-2 proved to be an ideal test aircraft for various powerplants, including the first generation of Soviet jet engines. The initial three-seat version. Top speed 635 km/h (395 mph) at 8,000 m (26,247 ft). Two 1,044 kW (1,400 hp) Mikulin AM-37 (water cooling), 1941. Redesigned for four-seat crew (influenced by Junkers Ju 88). Top speed dropped to 610 km/h (379 mph). It used the same engines as the ANT-58. As ANT-59 but powered by air-cooled Shvetsov ASh-82 engines after the AM-37 was cancelled. Tu-2S modified for interceptor role. Torpedo bomber prototype developed from the Tu-2D. Long-range four-engine heavy bomber project developed from the Tu-2, cancelled in favor of Tu-4. Also known as Tu-10. Five-seat long-range bomber similar to ANT-62 but powered by Charomskiy ACh-30BF diesel engines, 1946. Prototype three-seat night fighter version. Two 1,081 kW (1,450 hp) Shvetsov ASh-82 (air cooling) with bigger drag, 1942. Long-range version, it appeared in October 1944. It had an increased span and a crew of five aviators. Powered by two 1,380 kW (1,850 hp) Shvetsov ASh-82FN?, 1943? High-altitude reconnaissance bomber version developed from the Tu-2D, powered by two turbo-supercharged Mikulin AM-44TK engines. Only two aircraft were built for testing ejection seats. Powered by two 1,417 kW (1,900 hp) ASh-83 radial piston engines. Engine testbed, built to test the Rolls-Royce Nene turbojet engine. Two aircraft built to test barrage balloon cable cutters and deflectors. Prototype, armed with 57 mm cannon in the forward fuselage. Powered by two 1,380 kW (1,850 hp) Shvetsov ASh-82FN radial piston engines, 1943. Secretive night-fighter prototype developed under leadership of the NKVD special section of V. Morgunov and P. Kuksenko. Equipped with the Soviet Gneiss 5 (Гнейс 5) radar. Armed with two NS-45 autocannons. Development presumed to have started in 1943. Precursor of the Tu-1. Experimental ground-attack versions. 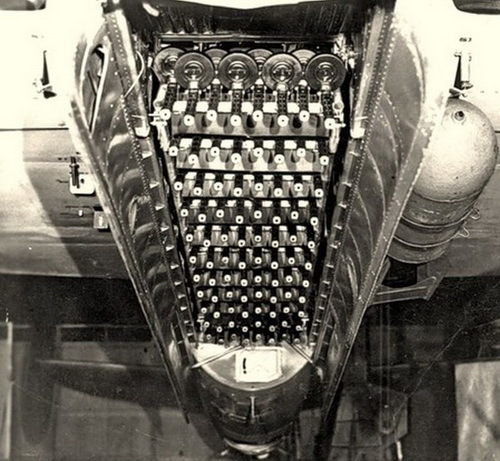 Two variants were tested in 1944: one with a 76mm (2.95 inches) centerline gun and another with a battery of 88 7.62mm (0.30 inches) PPSh-41 submachine guns fixed in the bomb bay, directed to fire ahead at a 30-degree angle. Another version under this designation was tested in 1946; this one had a frontal armament consisting of with two NS-37 and two NS-45 autocannons. Torpedo-bomber variant, was tested between February and March 1945, and issued to Soviet Naval Aviation units. Long-range bomber based on Tu-2D, 1947. It was a high-altitude variant that saw limited service, 1943. Medium-range jet bomber prototype, 1947. People's Liberation Army Air Force Imported 33 UTB-2 and 29 T-2U trainers at the end of 1949. The last four UTB-2s retired in 1965. Imported 311 Tu-2s from the end of 1949 to 1952. The last 30 Tu-2s retired in 1982. 3 × 7.62 mm (0.30 in) rear-firing ShKAS machine guns (later replaced by 12.7 mm (0.50 in) Berezin UB machine guns) in the canopy, dorsal and ventral hatches. ^ a b c d Jackson 2003, p. 154. ^ a b Jackson 2003, p. 155. ^ Н.В. Якубович (2010). Ту-2. Лучший бомбардировщик Великой Отечественной (in Russian). Коллеекция / Яуза / Эксмо. p. 39. ^ Gunston, Bill (1995). Tupolev Aircraft since 1922. Annapolis, MD: Naval Institute Press. p. 119. ISBN 1-55750-882-8. ^ (in Polish) Marian Mikołajczuk, Paweł Sembrat. Samoloty Tu-2 i UTB-2 w lotnictwie polskim, in: Lotnictwo z Szachownicą No. 33(3/2009), pp. 4–12. ^ Bonné, Frans. "WW2 Warbirds: the Tupolev Tu-2". Bishop, Chris. The Encyclopedia of Weapons of WWII: The Comprehensive Guide to Over 1,500 Weapons Systems, Including Tanks, Small Arms, Warplanes, Artillery, Ships, and Submarines. New York: Sterling, 2002. ISBN 1-58663-762-2. Jackson, Robert. Aircraft of World War II: Development, Weaponry, Specifications: Leicester, UK: Amber Books, 2003. ISBN 1-85605-751-8. Munson, Kenneth. Aircraft of World War II. New York: Doubleday and Company, 1972. ISBN 0-385-07122-1. Wikimedia Commons has media related to Tupolev Tu-2. This page was last edited on 15 March 2019, at 20:42 (UTC).